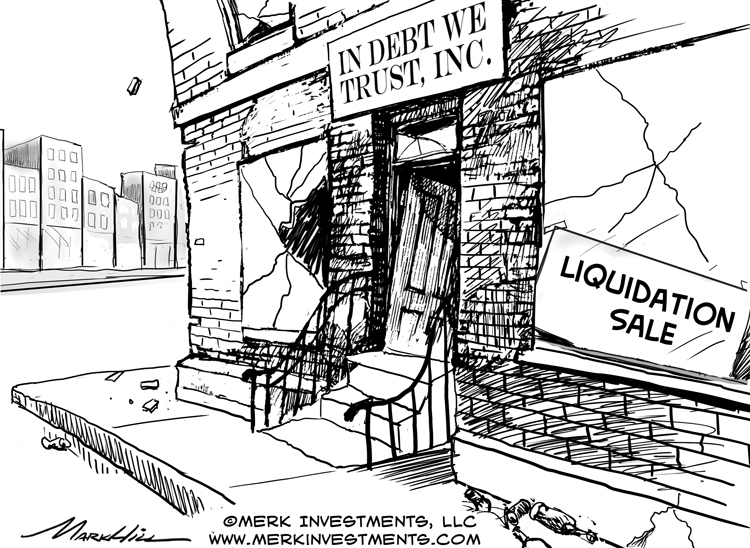 Merk Insights - U.S. Exorbitant Privilege At Risk?! If the road to hell is paved with good intentions, America’s exorbitant privilege might be at risk with broad implications for the U.S. dollar and investors’ portfolios. Let me explain. The U.S. was the anchor of the Bretton Woods agreement that collapsed when former President Nixon ended the dollar’s convertibility into gold in 1971. Yet even when off the remnants of the gold standard, the U.S. has continued to be the currency in which many countries hold their foreign reserves. Why is that, what are the benefits and what are the implications if this were under threat? Let me say at the outset that the explanation I most frequently hear as to why the U.S. dollar is the world’s reserve currency - “it is because of tradition” - which is in my opinion not a convincing argument. Tradition only gets you so far - it ought to be policies and their implementation that guide investors. In the context of today’s discussion, I would like to focus on what I believe may be the most under-appreciated yet possibly most important aspect of the so-called exorbitant privilege: what makes the U.S. so unique is that it is de facto acting as the world’s bank. A bank takes on (short-term) deposits and lends long-term, capturing the interest rate differential. The first has already happened. Due to a regulatory change, our analysis suggests it is less attractive to issue debt in U.S. dollars for anyone other than the U.S. government. The regulatory change might look arcane at first, but in our Merk Insight “The End of Dollar Dominance?”, we argued that a quirk in money market fund rules that could be interpreted as an implicit subsidy for issuers of debt has gone away. It’s more than a quirk because funding cost for just about everyone other than the U.S. government has gone up, as evidenced by elevated intra-bank borrowing rates (LIBOR rates) independent of the rise in Federal Funds rate. If our analysis is correct, it means that the U.S. dollar is a less attractive currency to raise money in than it had been. These days, issuers might as well issue debt in euros, a trend exacerbated by the extraordinarily low interest rates in the Eurozone. Let me provide the link to U.S. Treasuries as reserve holdings: take an emerging market corporate issuer raising money in U.S. dollars because of what used to be a funding advantage: upon issuing debt (raising cash), they might sell dollars to buy the emerging market currency to fund their operations. In the meantime, their government buys U.S. dollars and subsequently U.S. Treasuries to sterilize the corporate issuer’s sale of the dollar. Due to regulatory changes in U.S. money market, it may now be no longer advantageous to issue debt in U.S. dollars, eliminating the downstream effects, including the holding of Treasuries as a reserve asset. A second change is under consideration: the House GOP tax proposal would eliminate the deductibility of net interest expense. If passed, it could have profound implications on how issuers around the globe get their funding, as we shall explain below. If corporate America can no longer deduct net interest expense, we believe it will make the use of debt less attractive. It would discourage the use of leverage. Banks use a lot of leverage. And, as we are pointing out, one can look at the U.S. as a whole as if it were a bank. A system with less leverage may well be more stable; however, a system that uses less leverage may also have less growth. From the point of view of America’s exorbitant privilege, the key question in our view is how the world reacts. A plausible scenario to us is that American CFOs will move leverage to overseas entities where interest continues to be deductible. Similarly, to the extent that foreign issuers in the U.S. used U.S. legal entities to raise money, they would likely raise funds through foreign entities where interest expense would still be deductible. The question then becomes whether the money raised from these (newly minted) foreign entities would be in U.S. dollar or in foreign currency. If they raise money in foreign currency, the U.S. dollar would be cut out as the “middleman,” jeopardizing American exorbitant privilege. If you take a U.S. firm, if they decide to use foreign subsidiaries to issue debt, they might want to also report more revenue overseas to make it worthwhile to deduct more. CFOs are highly paid, in part we believe, because of their ability to engineer where to recognize revenue and expenses. We would expect CFOs to rationally optimize shareholder value in the context of the regulatory and tax framework they are presented with. Once you take the step of recognizing more revenue abroad, it would only be prudent to match the liability, i.e. the interest expense, in the same currency. But won’t the U.S. be a more attractive place to invest if the entire GOP tax plan gets passed? What about if the U.S. changes to a territorial tax system? What about the border adjustment tax (or a variant thereof)? If the U.S. were to move to a territorial tax system, i.e. no longer tax corporations on their global income, it may provide a further disincentive to issue U.S. debt. In the current tax system, corporations issue U.S. debt to fund domestic operations while avoiding the repatriation of foreign earnings. The concept of a border adjustment tax still needs to take shape before we can have a more definitive opinion about it. From what we see, it appears to foremost provide a one time shock to the system (possibly causing a one time inflationary impact as the cost of higher imports gets passed on to consumers); that said, corporate America might come up with a variety of tricks to mitigate the impact of such a tax (e.g. exporting fuel to their plant in Mexico, thus being able to deduct the cost of energy from imported goods). Not much discussed, but a potential U.S. dollar positive would be if indeed investments could be fully expensed the first years rather than a requirement to amortize expenses over many years, as in the current tax code. That is, if the U.S. incentivized investments over spending. We’ll discuss this in more detail once we have more clarity on the actual tax reform. In summary, providing a disincentive for debt might make the world more stable, but lead to lower growth. It might encourage more issuance of debt in local currency, something that might also be healthy for global stability, but might leave the U.S. and the greenback behind.